Rotating Assets: What Are They & What Can You Do With Them? Be careful, the clue is not in the name! The term “rotating assets” does not signify assets that rotate or spin around. Rotating assets are assets that are swapped in and out of service such as pumps, electronic control boards, engines or robot arms.Work order and move history stay with the asset throughout its lifetime as it is moved throughout the organization. In general, a rotating asset is a unique distinct item with its own unique asset code and serial number and is usually repaired or refurbished rather than replaced. Basically, they are interchangeable and repairable spares. Repairable parts are parts that are deemed worthy of repair, usually by virtue of economic consideration of their repair cost. Your organization has a cooling system with four identical pumps. They also keep one spare pump in stores. Each pump has its own unique ID and serial number. When one pump fails, it is removed and replaced with the pump from stores. The damaged pump is then repaired and returned to the storeroom and made available for the next failure. The work order history and location history travel with the pump throughout its lifetime as it is moved from one place to the next. In Fiix CMMS, stock items are considered consumables and disposed of at the end of their useful life. 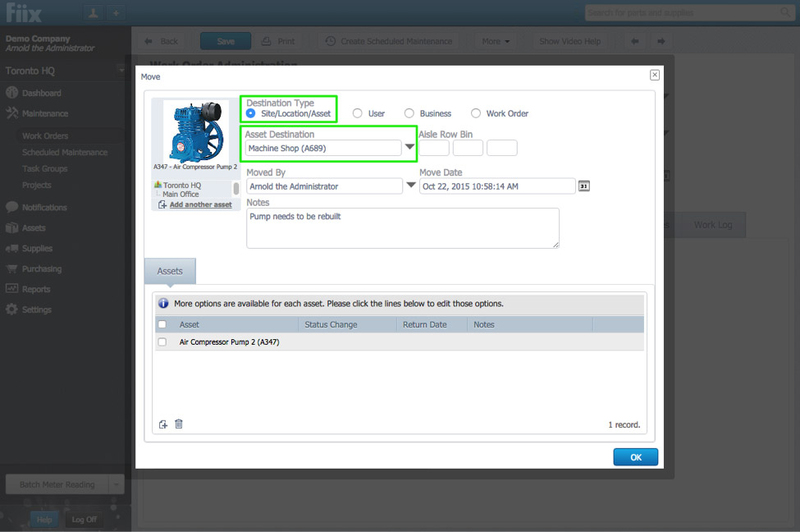 You cannot track work orders on stock items such as O-rings, seals and gaskets so any rotating assets must be created as an equipment record in your CMMS. What can you do with rotating assets? 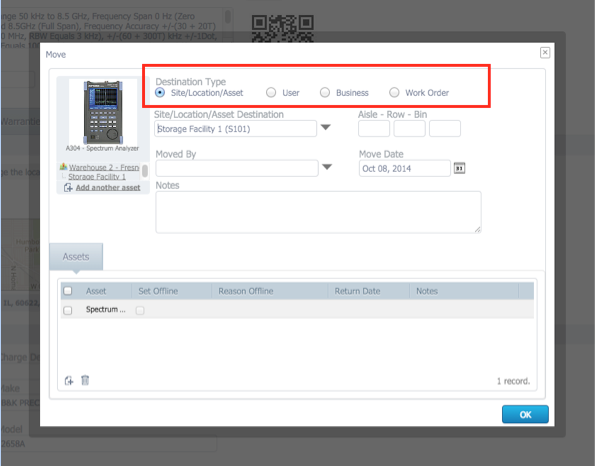 In Fiix CMMS, rotating assets can move between locations, be assigned to a user in transit, assigned to a business or be cycled to and from inventory to usage. Assign it to a user – This is ideal for companies that issue tools or specialized equipment to employees. The tool is checked out to the employee, and remains their responsibility until they check it back into its official storage location in the CMMS. Assign it to a business – If you lend your equipment or tools to a vendor, partner or customer, you can track this transaction on the asset record. Assign it to a work order – In this case, you can assign an asset to a work order, which means the asset is dedicated to this work order until it is returned. If you have specialized tooling, this means other users cannot use it until this work order is closed out. Throughout the lifetime of a rotating asset, work orders and moves are tracked in the log tab of the asset. 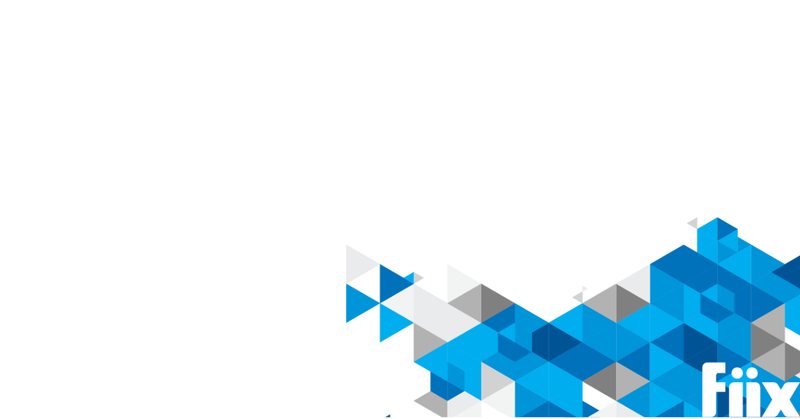 This ensures you have the full operational, transactional and overhaul history of the asset. The rotating assets feature is available for the enterprise package only. 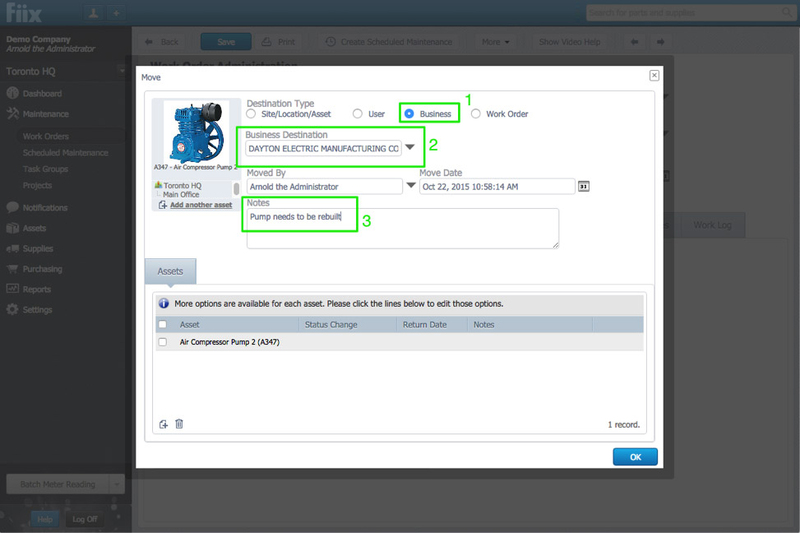 If you have the enterprise CMMS, you can switch on the rotating asset feature for your CMMS in the CMMS Settings -> Rotating Assets tab in your CMMS. 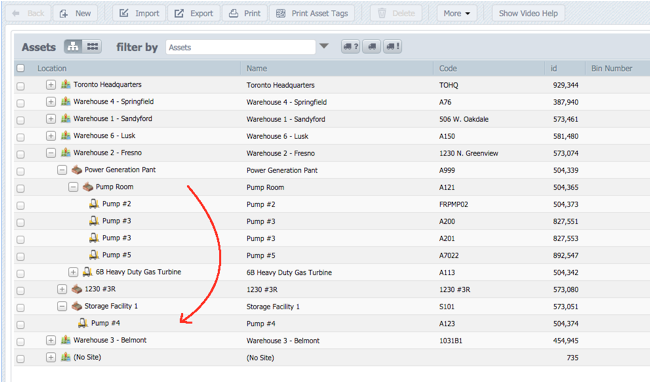 In this settings tab, you can also decide which users in the CMMS can use the rotating assets functionality in the CMMS. With the Rotating Assets feature enabled, at the top of each asset record, you’ll notice the Move button in the More dropdown menu. 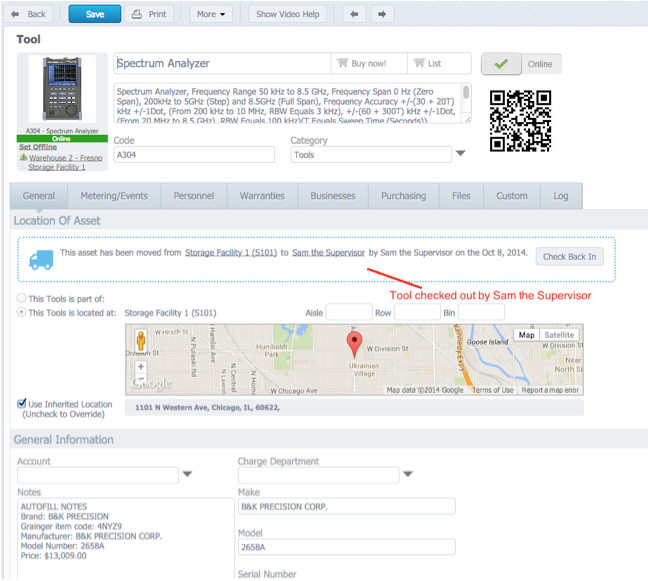 In this example, Sam the supervisor has checked out the spectrum analyzer in his name. He is then responsible for returning the equipment when he is finished. When Sam is finished, he can click the Check Back In button on the asset record to officially return it to its storage location. Update – October 21st 2015. In addition, it is now possible to rotate your assets on the work order. 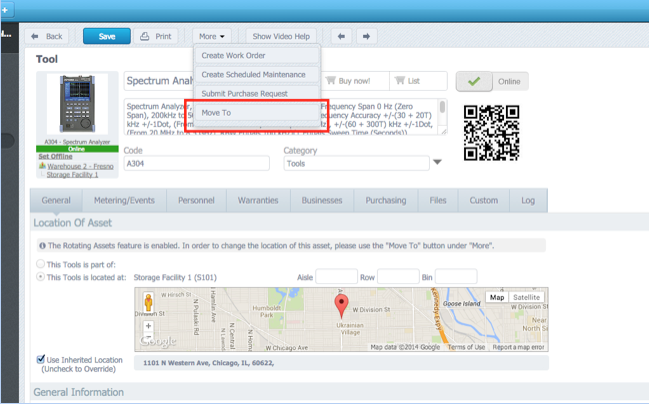 Just like on the asset record, the asset can be moved to another location, user, business, or the work order itself. Here’s an example scenario – while tackling a work order, the technician determines an air compressor pump cannot be repaired. The pump must be rebuilt. The technician can simply click the More-> Move Asset button at the top of the work order to rotate the pump out of production and into to the repair shop to be rebuilt. Alternatively, let’s say the pump is rebuilt but a 3rd party vendor. In this case, the technician would simply move the pump to a business in the move pop up screen. 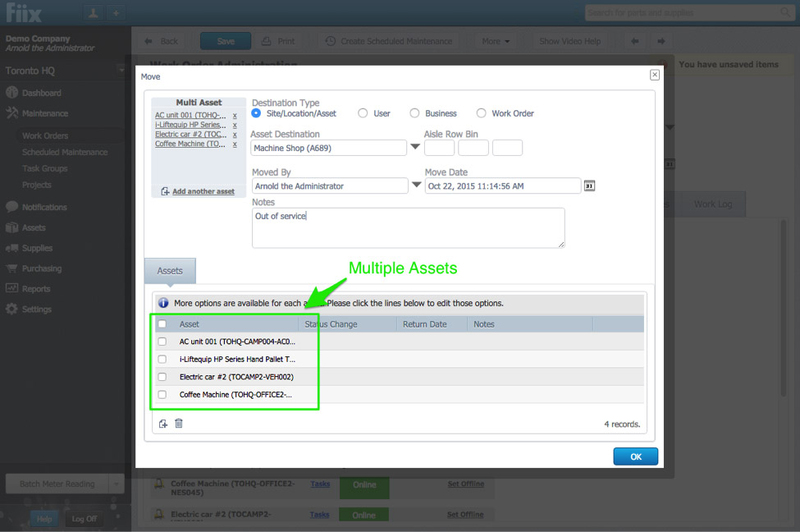 In addition, it is possible to rotate multiple assets on a multi asset work order. When the Move Asset button is clicked at the top of the work order form, all available assets are added to the move pop up window for processing. 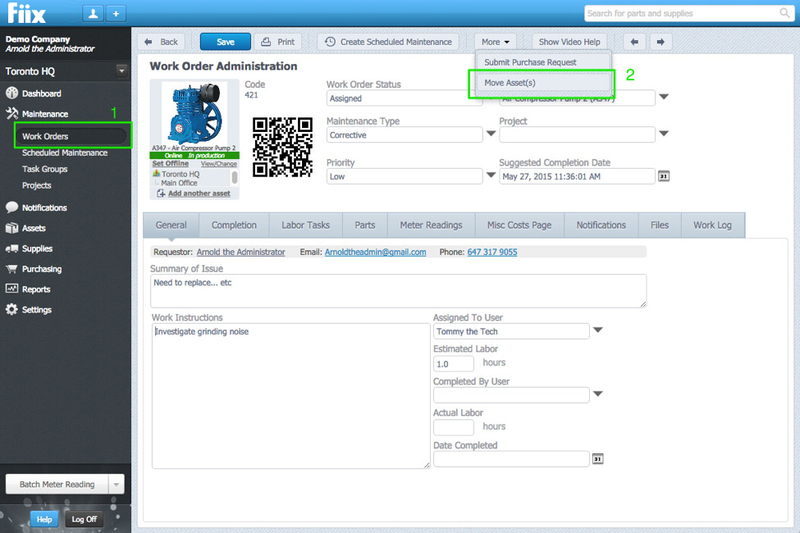 By adding the asset move functionality on the work order form, it reduces the number of clicks needed to get he job done, and gives the technician more context into what they are doing. 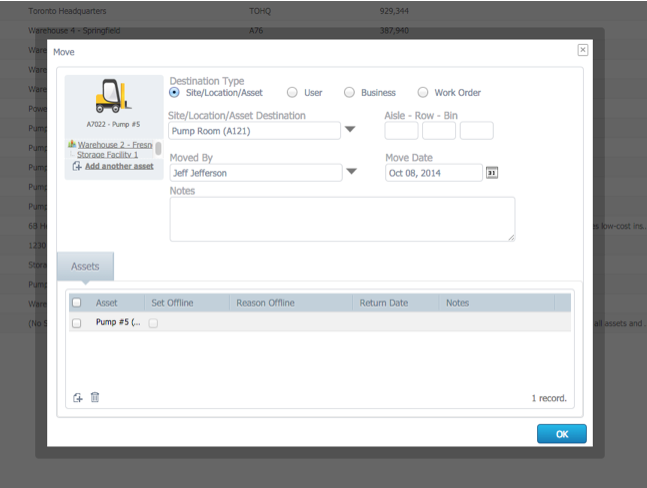 In addition, it reduces the chances they’ll get side tracked while navigating through other screens in the CMMS. In the following screenshot, I simply drag pump #5 from the storage facility and drop it into the pump room. This action is signifying removing the part from stores and putting it into production. After dragging and dropping the pump, you’ll see the following pop up window, which can be used to fill in some move data such as the reason for the move. You simply repeat the process by moving the damaged pump #4 from production to the storeroom for repair. Hopefully, you now have a good overview of your CMMS’s rotating asset functionality. See rotating assets in action here! You can now use rotating assets to manage your tool crib. For a detailed explanation on this check out our help center article.